The successful adoption of the Treaty on the Prohibition of Nuclear Weapons in July 2017 was a significant step forward for efforts to stigmatise, and ultimately ban, the final weapon of mass destruction not addressed by a specific legal prohibition. Much has, and will continue to be written on the treaty’s potential impact on ossified state-centric debates about nuclear security. The Humanitarian Initiative on Nuclear Weapons intentionally posed a direct challenge to the rarefied world of nuclear experts and think tanks, particularly those captured by, and actively participating in, the prevailing state security discourse. 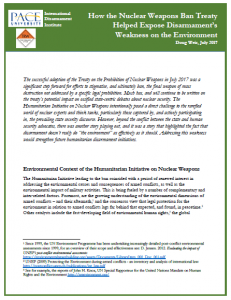 However, beyond the conflict between the state and human security advocates, there was another story playing out, and it was a story that highlighted the fact that disarmament doesn’t really do “the environment” as effectively as it should. Addressing this weakness would strengthen future humanitarian disarmament initiatives. Weir is Visiting Research Fellow in the Department of War Studies’ Marjan Centre at King’s College London and coordinates the International Coalition to Ban Uranium Weapons and manages the Toxic Remnants of War Project.